This heavy duty bucket from Toolzone is ideal for use around the site, farm, business enviroment, or home. 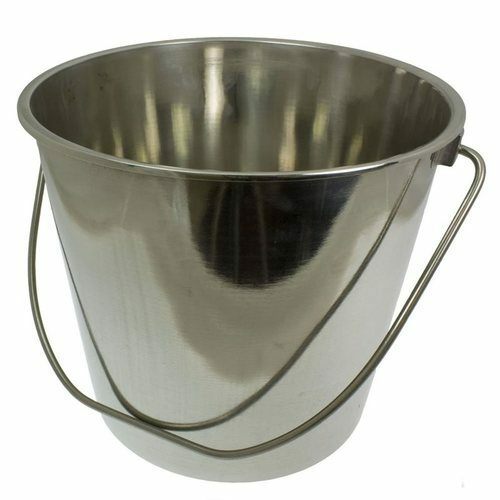 Constructed from rust-free and non-corrosive stainless steel, this bucket is safe for food storage such as rice or grains, milking livestock, or picking up general debris from a freshly finished contract job. With a convenient carry handle, this spacious 12L bucket provides multiple uses in any location. Bought this stainless steel bucket for the purpose to put hot ashes in when cleaning the log fire out ,,, galvanised buckets don’t last 5 minutes , this stainless steel bucket is first class quality , in fact to good for this purpose , but needs must , and the price was amazing, so reasonable, I would highly recommend this company .